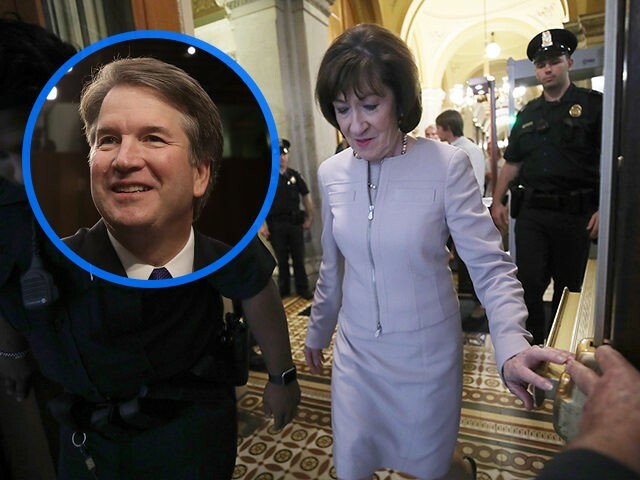 Sen. Susan Collins (R-ME), the crucial outstanding vote to confirm Judge Brett Kavanaugh to the Supreme Court, delivered an extended defense of his record on the Senate floor Friday afternoon as she announced her intention to vote for his confirmation. “Certain fundamental principles about due process, the presumption of innocence, and fairness do bear on my thinking and I cannot abandon them,” Collins said while addressing the central matter of the last several weeks: Christine Blasey Ford’s allegation that Kavanaugh sexually assaulted her at a high school party in 1982. Collins stressed that the confirmation process was not a trial and did not require proof beyond a reasonable doubt to disqualify Kavanaugh. Instead, she only demanded Ford’s accusations be “more likely than not” true. Collins did not find Ford’s allegations against Kavanaugh to meet even this standard. Collins began her eagerly anticipated floor statement began shortly after 3 p.m. to the sounds of shouting and chants from anti-Kavanaugh protesters, like so many of the proceedings over the months-long confirmation process. She launched promptly into an attack on the forces arrayed against Kavanaugh, lamenting their hysterical behavior compared to the five other “solemn” Supreme Court confirmations in which she participated. The moderate Maine senator expressed her outrage at organizations that forcefully opposed Kavanaugh before even copy-and-pasting his name into their material and Democrats who announced their intention to end Kavanaugh’s nomination before hearing a word of testimony. Collins then, in stark contrast to the weeks of controversy over uncorroborated accusations about Kavanaugh’s behavior as a teenager, dug for over 20 minutes into Kavanaugh’s 12-year record as a federal judge and his judicial philosophy as gleaned from extensive Senate Judiciary Committee testimony and her own meetings with the nominee. On privacy, healthcare, executive power, and his ability to fairly judge the president who nominated him, Donald Trump, Collins one-by-one addressed Kavanaugh’s opponents’ concerns. On the centrally important issue of abortion, the pro-choice Collins gave a lengthy refutation of the notion Kavanaugh would overturn Roe v. Wade.